I’ve been a little disheartened, dismayed and generally hacked off this last week or so (hence the lack of posts). This is largely due to ‘unauthorised use’ of one of my images, which I accidentally stumbled upon. If there was a button I could have pressed to pull this blog off line then that’s what I would have done. Unfortunately there isn’t, so I’m faced with a long, protracted process of trawling back through posted images to ensure that I’ve “protected” them as fully as possible. People. Google Images is NOT a free bank of photos from which you can pick, choose, download any image you like, put on the front cover of a brochure, print as many as you like and sell for whatever price you like. You need to ask first. It’s just polite, isn’t it? And not only is it polite. It’s the freaking law. Ok, I’m mostly hacked off with myself for my own carelessness. 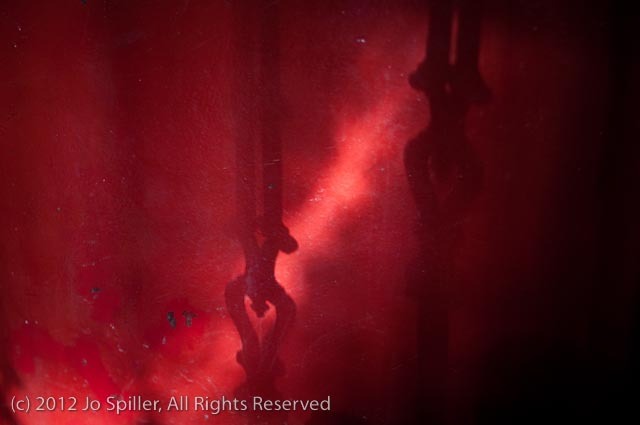 And on the plus side – I really like this image of red shadows I took in my stairwell, just hating the ugly watermarking. I read this after you were good enough to leave a comment on my blog. What should I be doing to protect my images. Hi There – I got some great advice from Paul at http://www.redeye.org.uk – there are four things that I did wrong. Firstly, the resolution of the image I posted was too high (high enough to print successfully). I hadn’t clearly stated copyright on the site and I hadn’t embedded my details into the file (still not quite sure about how to go about doing that). I also stated that I wasn’t a professional photographer. None of this, however, affects your rights as the owner of the photo but it makes it a little easier to justify using it without permission. School girl errors on my part, chalked up to a valuable learning experience. Best of luck in getting a quick resolution. I struggle with the best way to share, yet protect. I wish you the best. Good luck with your fight to protect your images. I’ve had illustrations stolen a couple of times (that I’m aware of) and it’s very disheartening. It’s astonishing to me that so many are so clueless. Or not clueless and just don’t care. One of my images was taken for use on a website arguing that copyright law is unreasonable and should be abolished, so the owner clearly knew that it was illegal. (The image was a graphic of a burglar and was titled “thief”—the irony just oozes. I’m really sorry that happened to you. I completely share your outrage and anger. The photograph you’ve posted today is fantastic. I don’t know what programs you use for photography, but if you run Creative Suite you can use Adobe Bridge to put a copyright notice into the metadata. If you don’t use CS but do use Photoshop, you can do something similar with Photoshop. There are also ways to embed a digital watermark into your images using the Digimarc system, but this requires registering with Digimarc.